This unusual ABBA record isn’t so unusual for its contents but for its cover image. 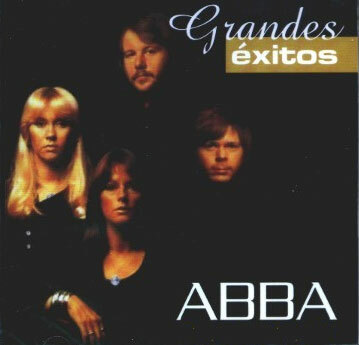 Grandes Éxitos was released by Universal Music in Venezuala in 2002. Its tracklist is identical to the CD The Best Of ABBA – The Millenium Collection, first released in the USA and Canada in 2000, featuring 11 ABBA hits. But what’s unusual is the image on the front cover. At first glance it appears to be a rearranged version of a familiar photograph from 1976. However on closer examination the image was actually copied from the original version of ABBA World (2000-2004). You can see that Frida’s necklace is bluish, rather than glittering golden, almost white as it normally looks. As a design feature for the website I’d replaced every round item in the image (even the buttons you can see on Agnetha’s front) with the world globe that featured as part of the ABBA World site logo at that time. ABBA Intermezzo International Fanclub has recently celebrated its 20th anniversary with a bumper celebratory issue of their regular magazine. The fan club started out in 1990 as a simple black & white fanzine like so many that had gone before. Over the years it has grown to a full colour magazine for the hundreds of members, with correspondants reporting ABBA news from all around the world. Happy anniversary to Regina and her team!